Recently, a good friend unfortunately had a dog that was bitten by a rattlesnake. His dog had been taken to a vet ER, injected with an antivenom, antibiotics, etc. but later had died. He added that the dog and another dog lived in the country area. The country area is known for venomous snakes such as rattlesnakes, copperheads and so on. The second dog too was bitten by the rattlesnake. I asked him was it still alive? He stated yes, but it wasn’t doing well after being bit, and had similar inflammation, swelling, lethargy, pain, etc. to the other dog before it died. 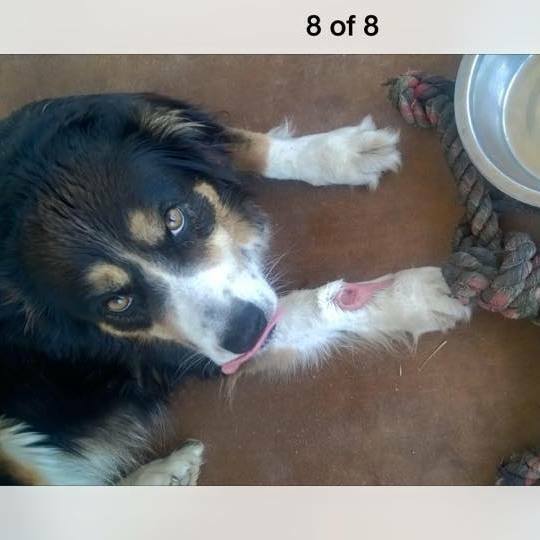 This was the next day, and he texted me a photo of the 2nd dog’s leg still alive showing the rattlesnake bite, swelling and infection. I told him venomous creatures such as snakes and scorpions are administered a type of anti-venom or a vaccination by vets or ER for humans. 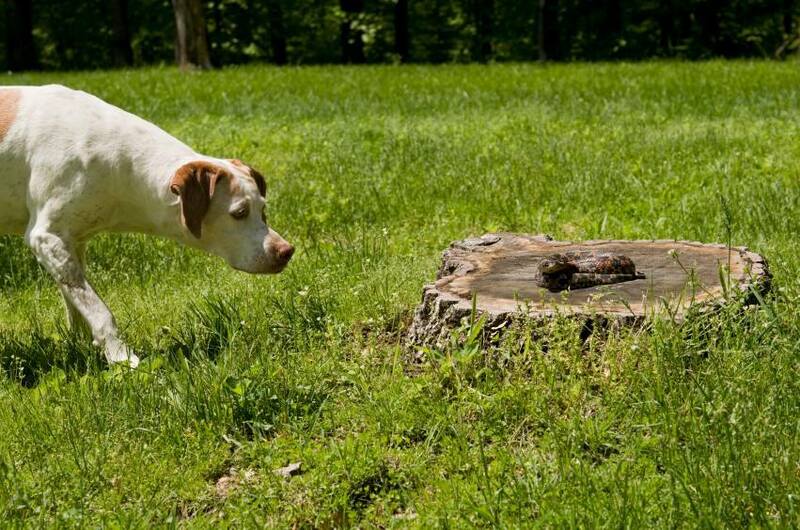 This did not help the first dog, as it had passed away. 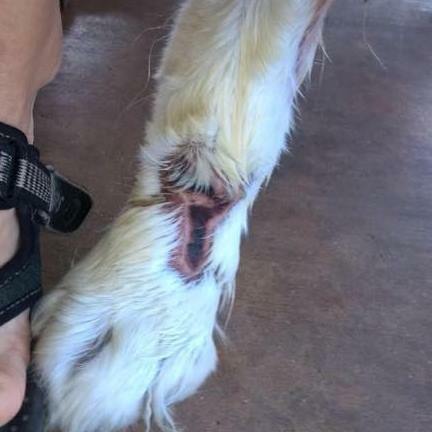 The second dog’s bite was becoming necrotic on the wound but had not been taken to the vet for a similar treatment yet. To understand how Antivenom works, we need to understand how venom works. 1. Venom is made of a mixture of proteins and each can individually produce a different response. 3. Another example is Chlorotoxin, found in the venom of the Deathstalker. “Snake Oil” is a term coined during pioneer days in the United States that became a synonym for fraud. Actually “snake oil” was a legitimate product sold by traveling salesmen throughout the frontier West as a first aid remedy for rattlesnake bites. Applying the oil on the site of the bite would react chemically with the venom and render it harmless. It worked. The essential oil was Tea Tree (Melaleuca alternifolia). Unfortunately, not all salesmen were honest and some were selling just any old cheap oil in a bottle and calling it “snake oil.” When people discovered that it did not work, all snake oil salesmen were branded as untrustworthy. In the late 1900s and early 20th century, when it became known that some essential oils promoted as effective snake bite remedies did not work and had been sold by deception, drug companies spread another fraud saying that natural remedies, in general, were unscientific and did not work while the synthetic potions they manufactured were scientific and better. Hence, even to this day, those of us who promote natural remedies are sometimes called “snake oil salesmen” as a put down for our practice and our products. NOTE: For more information on how and why essential oils work, see the book, The Chemistry of Essential Oils Made Simple – (God’s Love Manifest in Molecules) by Dr.David Stewart. Snake bite causes a coagulopathy – a blood coagulation disorder, and this is the problem. Clinically however, there has been some suspicion about the effectiveness of antivenom because it does not reverse the coagulopathy, initially resulting in larger and larger doses being given (up to 23 vials in this brown snake study). The current recommendations are to use 1 vial only, because more doses are ineffective, and this recommendation is based on lab evidence (that has not translated into clinical effectiveness for other antivenoms). RESULTS: Neither antivenom dose nor time of antivenom administration had an effect on recovery of VICC. DMSO (1%, v/v, final concentration) did not interfere in proteolytic activity of B. jararaca. NOTE: Proteolytic activity is the breaking down of proteins into simpler compounds, as in digestion. NOTE: B. jararaca.is a species of pit viper endemic to southern Brazil,Paraguay, and northern Argentina. DMSO alone did not interfere in clotting times. Neither HBSE alone induce hemolysis, nor the hemolytic activity induced by B. jararaca venom mixed with DMSO was affected. NOTE: Hemolysis is the destruction or dissolution of red blood cells with release of hemoglobin. NOTE: Hemorrhage is excessive discharge of blood from the blood vessels; profuse bleeding. I was a bit confused. Why did his dog get injected with scorpion antivenom? Snake antivenom or antivenin is limited, but it would seem that perhaps scorpion antivenom may not work against rattlesnake venom? I will get back to this more at the end. I remembered one thing about our Miracle oil. There was a time a friend of mine was stung by a bee in 2015 when we were talking in a parking lot. We removed the stinger, and he began to have the usual allergic reaction with swelling and shock. It had an anti-histaminic effect. Here are photos he took as it happened. It also had a similar effect on a woman I met at a wedding in 2015 that had Rheumatoid arthritis. She was bitten by a mosquito, and due to her low immunity system, she had a similar allergic reaction to a mosquito bite. We carry our oil everywhere we go for general reasons, and I applied a few drops on the mosquito bite. Granted, both above are hardly clinical trials, but they are on the job work and a type of a blind test. I was pleased to see both had a recovery in about five minutes. Bee stings and mosquito bites are not snake venom, but bee stings are treated at allergy centers and are a form of reaction scorpions, and snakes like other creatures listed above cause. In this study of essential oils countering tumor necrosis, geranium essential oils used as antiinflammatory remedies suppress neutrophil activation by TNF-a at a low concentration (0.0125/0.025%) in vitro, and was one of the strongest suppressing activity oils. Lavender and Eucalyptus were also successful. Lavender was not as effective as Geranium, yet its aid at countering necrossis from the study stated it could be explained by other mechanisms, because they also suppress degranulation of mast cells or cytokine production. Remember cytotoxic venom above? NOTE: Neutrophil is any cell, structure, or histologic element readily stainable with neutral dyes. NOTE: Adhesion is a fibrous band or structure by which parts abnormally adhere. Back to the rattlesnake bite, inflammation is a reaction that needs to be controlled. Wintergreen has shown very strong effects against inflammation in an arthritis study30, and data elsewhere on this website shows other oils here have anti-inflammatory effects as well. – None of the dogs died during the study period. – The mental status was reduced in 60/75 (80%) of dogs on Day 1, compared to 19/75 (25%) on Day 2. – The proportion of dogs with no or only mild edema increased significantly from Day 1 to Day 2. – About one-third of the dogs developed gastrointestinal signs during the study period. – Cardiac arrhythmia was uncommon. – Clinicopathological changes included increased total leucocyte count, CRP and troponin concentration on Day 2. – The cTnI concentration was increased in dogs with systemic inflammation, compared to dogs without systemic inflammation. – A single dose of prednisolone did not significantly affect any of the clinical or clinicopathological parameters studied, except for a higher monocyte count on Day 2 in dogs that had received prednisolone treatment. Why did his vet administer scorpion antivenom? Perhaps he did not have a supply of specific rattlesnake venom, but only his ER vet knows best why. Antivenom is made for spiders, or other creatures that have no relevance to snake venom or treatment. Above research clearly prescribes rattlesnake vaccine from W. diamondback does not work for others. Serotherapy is a treatment that consists of the administration of specific serums that promote self-healing of our body whether through vitamins, nutrition or in this case snake venom. In Sao Paulo, Brazil there was a study showing the authors report a case of bothropic envenoming in a male Cocker Spaniel. The animal was bitten in the ventral thoracic region, receiving treatment 4 hours later. 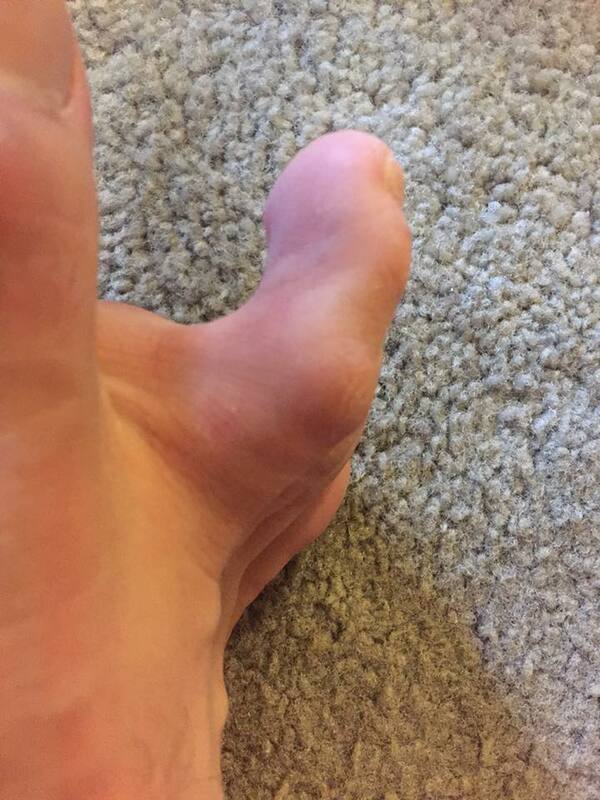 Clinical examination revealed an extensive, painful and area of firm edema, absence of local or systemic hemorrhage, without evident neurological alterations. Clinical diagnosis was mild bothropic envenoming. Treatment consisted of 5 vials of polyvalent snake antivenom, two vials administered intravenously and three subcutaneously. Blood clotting time was always within normal values. Two days after envenoming, the animal showed hyperthermia and received enrofloxacin (5mg/kg/24h) for 10 days and ketoprofen (1mg/kg/24h) for 5 days. Seventy-two hours after envenoming, extensive subcutaneous, muscle fiber, and skin necrosis of approximately 10 cm in diameter was observed. After débridement of necrotic tissues, the area was cleaned with antiseptic solutions. Complete healing was observed 55 days after envenoming. When my friend told me the second dog was still alive but had the same effects as first dog, he mentioned that it had not been taken to an ER by the owners yet. I asked him had it been given anything, and he responded by stating the owners did not, hoping it would heal. He told me he was visiting the family and dog to see an update that day. I told him to bring a bottle of the Miracle oil with him and apply it immediately to the dog’s wounds in case of infection. Since the dog had no treatment and was in pain and infected, I felt something may help, and our oil is not toxic to dogs when applied topically. The other dog passed away the night before. None of the shots above worked, as snake bites are attempted to be controlled where it doesn’t get worse with medications and the antibodies are used in the hope of countering the venom. Back to his second dog. 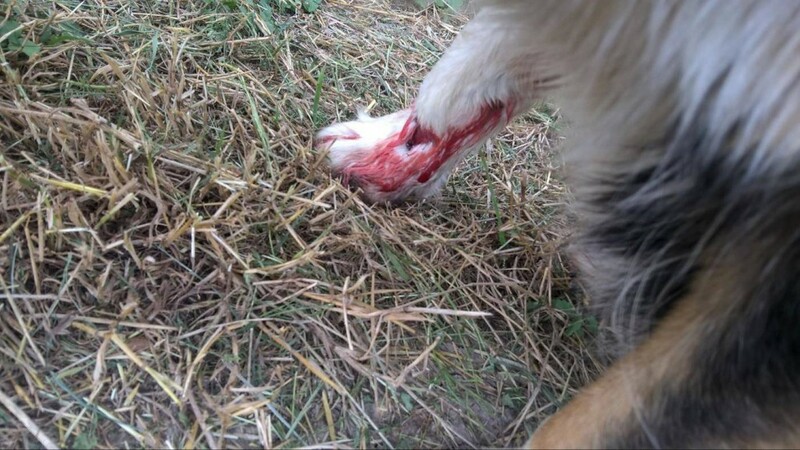 He told me the dog was experiencing similar results from the rattlesnake bite, swelling, edema, bleeding, necrosis, etc. 6/10/2016- Irish Terrier “Bria” was bit in the late afternoon/early evening by a rattlesnake on face. Snake was never found. Bria was taken to emergency room in obvious pain- potentially several hours after bite occurance. After treatment she became non-responsive, heavy breathing, and still in obvious pain when forced to take medication/liquids. Note: Vet informed that the snake bite location on her face should not have effected breathing. Results: Bria was non-responsive/zombie-like immediately following initial treatment. Taken home for the night. Dead by morning- having never changed position. Bria passed away by morning. 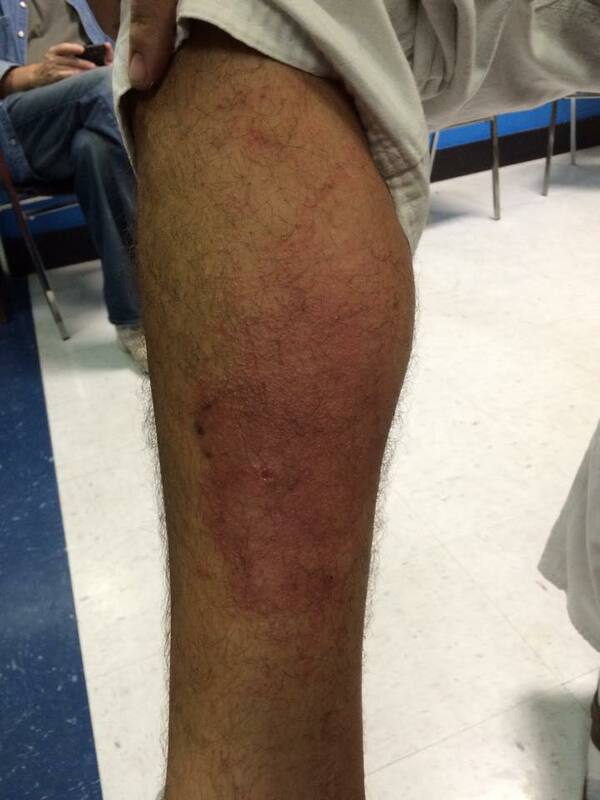 6/11/2016 a second pet was struck on the leg and possibly face (no facial marking, but large swelling)….snake was still not found. NOTE: photo above was last day SJMO was applied. Owners purchased DMSO product to apply as a self remedy instead. 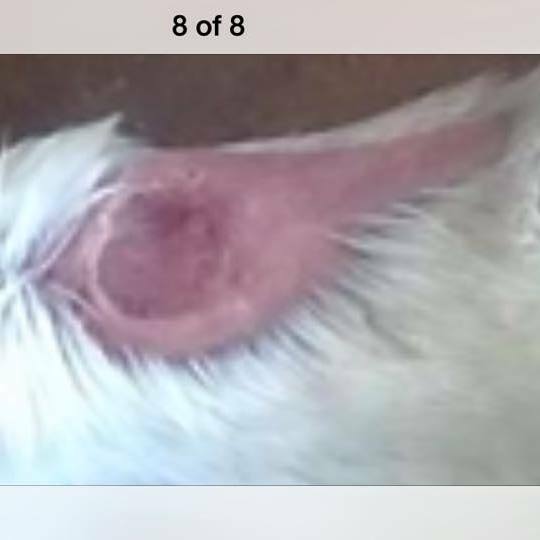 Close up shows wound is healing, good color, no necrosis, or dead tissue from scabbing. 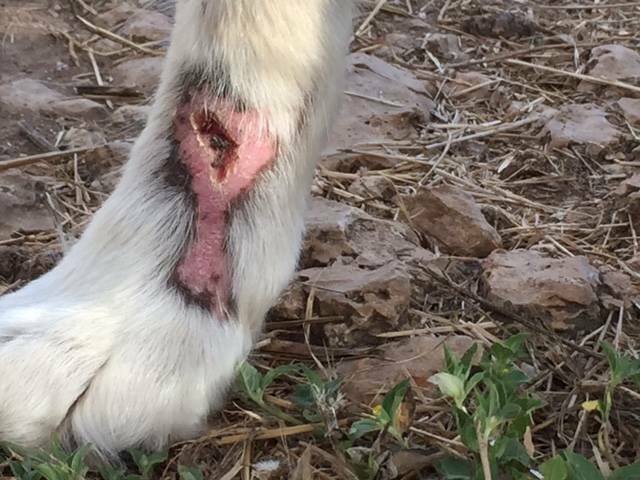 7/1/2016- Informed by friend that owners purchased DMSO purchased at a Vet clinic, and has been applied to wound daily for about 10 days. Informed SJMO was being applied the first 7-10 days and then was stopped. 7/4/2016- SJMO has not been used for weeks at this time. 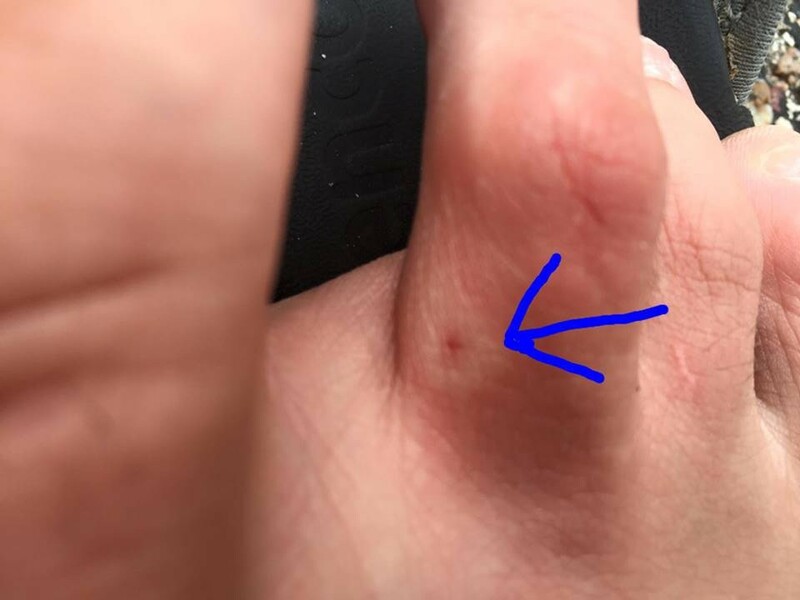 Wound appears to have scabbed over/healing. Side note: During course of treatment, owner discovered large cancerous tumor on stomach of dog. 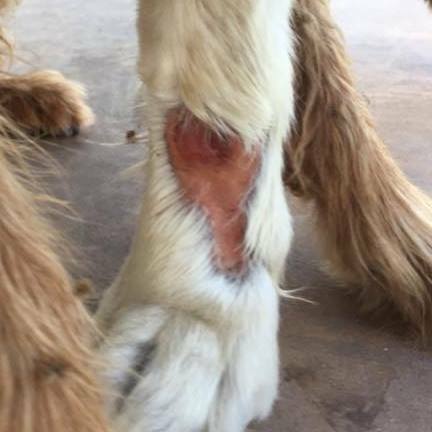 Dog has irritated wound by scratching, post surgery/removal. NOTE: inflammation, dead tissue, clear swelling seems to have returned on dog. In final, I do not know the current update of the dog and it’s rattlesnake bite toxicity level nor it’s condition. We do see at least on an anecdotal trial, the SJMO seems to have improved the rattlesnake bite venom response comparing necrotic tissue and the bright pink wound later seeming to be healthier. In speculation, we do not have any pure blind tests here, but perhaps the anti-inflammatory, anti-microbial, anti-histaminic and anti-bacterial agents of the essential oils in the SJMO (see references) may have been the improvement during the time it was used. Unfortunately we will never know. Consumers have used the oil for insect bites, and on pets we have referenced research on ticks, fleas, mosquitos and other insects. Perhaps in the future we can also look at future clinical trials with certain essential oils and the efficacy on not only snake venom, but insects, ticks, marine animals, scorpions and others as well.